Made of an easy to wash and wear 7.5 oz. Poly/Cotton twill fabric. 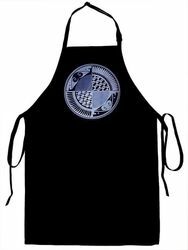 Apron is full sized at 34”L x 23”W, featuring two pockets at waist level as well as an adjustable neck back.